I smile. 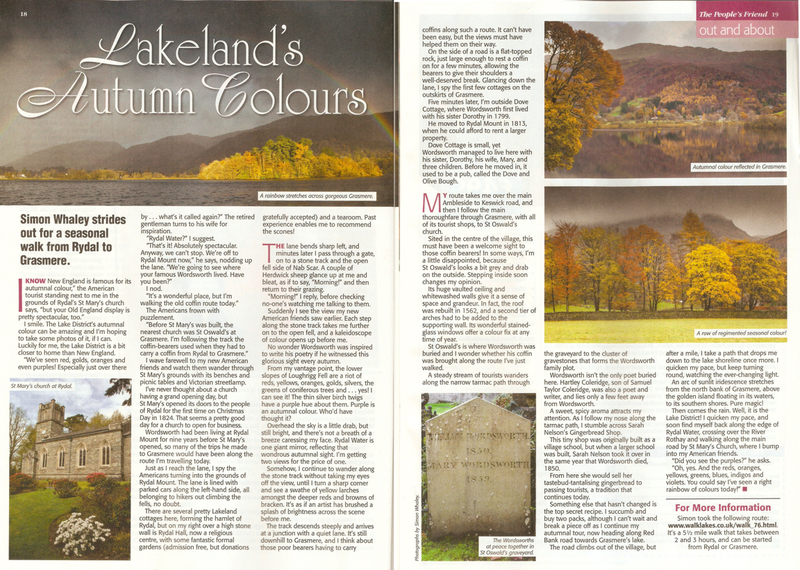 The Lake District’s autumnal colour can be amazing and I’m hoping to take some photos of it, if I can. Luckily for me, the Lake District is a bit closer to home than New England. “ We’ve seen red, golds, oranges and even purples! Especially just over there by … what’s it called again?” The retired gentleman turns to his wife for inspiration, his arm outstretched, pointing through the trees. The American’s frown with puzzlement. I wave farewell to my new American friends and watch them wander through St Mary’s grounds, with its benches and picnic tables and Victorian streetlamp. I’ve never thought about a church having a grand opening day, but St Mary’s opened its doors to the people of Rydal for the first time on Christmas Day in 1824. That seems a pretty good day for a church to open for business. Wordsworth had been living at Rydal Mount for nine years before St Mary’s opened, so many of the trips he made to Grasmere would have been along the route I’m travelling today. Just as I reach the lane, I spy the American’s turning into the grounds of Rydal Mount. The lane is lined with parked cars along the left hand side, all belonging to hikers out climbing the fells, no doubt. There are several pretty Lakeland cottages here, forming the hamlet of Rydal, but on my right over a high stone wall is Rydal Hall, now a religious centre, with some fantastic formal gardens (admission free, but donations gratefully accepted), and a tea room. Past experience enables me to recommend the scones! The lane bends sharp left, and minutes later I pass through a gate, onto a stone track and the open fell side of Nab Scar. A couple of Herdwick sheep glance up at me and bleat, as if to say, “Morning!” and then return to their grazing. “Morning!” I reply, before checking no one’s watching me talking to the sheep. Suddenly, I see the view my new American friends saw earlier. Each step along the stone track takes me further onto the open fell, and a kaleidoscope of colour opens up before me. No wonder Wordsworth was inspired to write his poetry if he witnessed this glorious sight every autumn. From my vantage point, the lower slopes of Loughrigg Fell are a riot of reds, yellows, oranges, golds, silvers, the greens of coniferous trees and … yes! I can see it. The thin silver birch twigs have a purple hue about them. Purple is an autumnal colour. Who’d have thought it? Overhead the sky is a little drab, but still bright, and there’s not a breath of a breeze caressing my face. Rydal Water is one giant mirror, reflecting that wondrous autumnal sight. I’m getting two views for the price of one. Somehow, I continue to wander along the stone track without taking my eyes off the view, until I turn a sharp corner and see a swathe of yellow larches amongst the deeper reds and browns of bracken. It’s as if an artist has brushed a splash of brightness across the scene before me. The track descends steeply and arrives at a junction with a quiet lane. It’s still downhill to Grasmere, and I think about those poor bearers having to carry coffins along such a route. It can’t have been easy, but the views must have helped them on their way. On the side of a road is a large flat-topped rock, just large enough to rest a coffin on for a few minutes, allowing the bearers to give their shoulders a well-deserved break. Glancing down the lane, I spy the first few cottages on the outskirts of Grasmere. Five minutes later, I’m outside Dove Cottage, where Wordsworth first lived with his sister Dorothy in 1799. He moved to Rydal Mount in 1813, when he could afford to rent a larger property. Dove Cottage is small, yet Wordsworth managed to live here with his sister, Dorothy, his wife, Mary, and three children. Before he moved in, it used to be a pub, called the Dove and Olive Bough. My route takes me over the main Ambleside to Keswick road, and then I follow the main thoroughfare through Grasmere, with all of its tourist shops, to St Oswald’s church. Sited in the centre of the village, this must have been a welcome sight to those coffin bearers! In some ways, I’m a little disappointed, because St Oswald’s looks a bit grey and drab on the outside. Stepping inside soon changes my opinion. It’s huge vaulted ceiling and whitewashed walls give it a sense of space and grandeur. In fact, the roof was rebuilt in 1562, and a second tier of arches had to be added to the supporting wall. Its wonderful stained glass windows offer a colour-fix at any time of year. St Oswald’s is where Wordsworth was buried and I wonder whether his coffin was brought along the route I’ve just walked. A steady stream of tourists wander along the narrow tarmac path through the graveyard to the cluster of gravestones that forms the Wordsworth family plot. Wordsworth isn’t the only poet buried here. Hartley Coleridge, son of Samuel Taylor Coleridge, was also a poet and writer, and lies only a few feet away from Wordsworth. A sweet, spicy aroma attracts the attention of my nostrils. It’s not what I was expecting to smell in a graveyard, but as I follow my nose along the tarmac path, I stumble across Sarah Nelson’s Gingerbread Shop. This tiny shop was originally built as a village school, but when a larger school was built, Sarah Nelson took it over in the same year that Wordsworth died, 1850. From here she would sell her tastebud-tantalising gingerbread to passing tourists, a tradition that continues today. Something else that hasn’t changed is the top secret recipe. I succumb and buy two packs, although I can’t wait and break a piece off as I continue my autumnal tour, now heading along Red Bank road, towards Grasmere’s lake. On my right I spy a regimented row of autumnal colour. This time it’s yellows, oranges and reds of a row of trees, planted along a stone wall. Low cloud hugs the mountain tops behind. It may be a grey day, but my trip couldn’t be more colourful. Or so I thought. As I follow the road round, I come face to face with a beautiful specimen of a beech tree. Its trunk and branches supporting a wonderfully golden crown of leaves. Now that’s what I call a proper autumnal tree! The road climbs out of the village, but after a mile, I take a path that drops me down to the lake shoreline, once more. Now I’m presented with another dazzling autumnal view of White Moss Common reflected in Grasmere. In amongst the luscious luminous larches, and gorgeous coniferous greens, stunning copper-coloured canopies speckle the scene. But what’s this? A breeze ruffles my hair. The waters of Grasmere shimmer the reflection, turning it from a mirror-like reflection to a blurry expressionist oil painting. Looking up I see a new colour for the day. Blue. There’s a patch of blue sky, but not enough to make a sailor’s uniform as my grandma used to say. As my eyes scan northwards, I see darker greys heading my way. I do believe I can smell rain in the air. I quicken my pace, but keep turning round, watching the ever-changing light. Suddenly, the grey expanse behind me is illuminated by a shaft of sunlight, spotlighting Allan Bank. Guess what? That’s another one of Wordsworth’s houses! But there’s no time to consider Wordsworth’s opinion of this property, which he called, ‘a temple of abomination’ when he watched it being built, because the rain is heading towards me fast. Before it reaches me, I’m treated to another Lakeland spectacle of colour: a rainbow. An arc of sunlit iridescence stretches from the north bank of Grasmere, above the golden island floating in its waters, to its southern shores. Pure magic! Then comes the rain. Well, it is the Lake District! I quicken my pace, and soon find myself back along the edge of Rydal Water, crossing over the River Rothay and walking along the main road to the bus stop by St Mary’s Church, where I bump into my American friends. “Did you see the purples?” he asks.